When Alison's maternal grandmother, South Londoner, Winifred ODonnell, was buried in Dublin in 1972, her family knew her as a mother who had once, many years before, lived in China for a time, and been a glamorous singer under the stage name of Nina Leigh, in London's West End in the early 1920s. Mindful of the strong bond through their careers in music, and curious about the gaps in her baby book, she decided to search for her grandmother's real identity. After several years of research, she discovered that Nina was a bigamist who had been forced to abandon her first family in favour of her second, a decision that was to destroy her peace of mind. Alison followed Nina's trail from a ship passenger list in 1919, piecing together her grandmothers upbringing and marriage, leading eventually to an abandoned daughter, Betty, a deceased son, Raymond, and four grandchildren. Nina's first family dealt with the loss of a mother and grandmother, and the second family coped with the knowledge that their beloved mother and grandmother had left two young children behind. A strong-willed character, Nina had tried to maintain occasional contact with the children for several years at a distance, fearful that her father would track her down and expose her, in an action that would have devastated both families. Back in 1911, Walter James Leigh, whom she met at a tennis club in London, courted the fifteen year-old Winnie. Walter was ambitious to forge a career either in America or China. He claimed to have been born of American parents who had died in the Boxer Rebellion. Archibald Little, a well-known explorer and merchant living in China with his wife Alicia, herself a prolific author, feminist and co-founder of the Anti-Footbinding Society later adopted him. Winnie's father Charles William Shears, who worked for the GPO in London for 41 years, was suspicious and mistrustful of the foreign-looking young man who spoke Chinese and wanted to take his daughter far away. They married, without his consent, when Winnie was 18 and after ten months their son was born. Armed with an inheritance of £500 from his adoptive father, Walter left London for a clerical appointment in Hankow, travelling some six months ahead of his wife and child. During the journey he was shipwrecked by a German U-Boat at the end of 1915. He declared himself an American but the U.S. authorities at Port Said quickly discovered that there was no trace of his nationality entitlement in their records in Washington. He stated that he would be able to produce the evidence to prove his claim once he reached Shanghai, and although he was allowed to proceed, he was never granted U.S. citizenship. Within a year his wife wanted to return to England, and Walter, for reasons not known, found himself persona non grata in their social circle. Letters written in the 1930s, long after Nina had disappeared into her second life, indicate that Walter had become an unwelcome figure and a 'brute' according to one of her friends in China. A DNA test conducted on his daughter Betty (born 1919) which was organised by the BBC during the making of the documentary 'Mother of Pearl' as part of the Family Ties series, showed her to be a quarter East Asian; a fact that had long been suspected. The likely significance of this is that Walter possibly had one Chinese parent, a fact he desperately sought to conceal. Mixed-race children living in China in the early part of the twentieth century were not accepted in any of the foreign concessions. In the early 1920s Nina met and fell in love with Major P.S.G. ODonnell, a Bandmaster and Director of Music with the Royal Marines, and latterly of the famed BBC Military Band (1927-1943), a role he took over from his brother Bertie. He knew his third wife (his first died in childbirth leaving him with a sickly child who died at the age of 9) had been disowned by her parents but was unaware that she had a husband and two children. He went to his grave in 1945 unaware of the full facts of her past existence. P.S.G. married his second wife, an Irish Catholic violinist in India, but a few years later, unable to bear the cold climate of England, she left him. P.S.G. and Nina had three children before, finally, he was able to gain a divorce in 1928. He then married Nina in a secret ceremony at Hampstead Registry Office, unaware that she was a bigamist. Nina maintained her silence and for some years she tried to keep contact with her mother Ellen and with the two children who were being raised by their grandparents. Eventually, she was forced to cut her ties with relatives and friends from her past to protect her new identity as the wife of a prominent conductor. Percival Sylvester George ODonnell, loving husband and father, was also eldest brother to Bertram Walton and Rudolph Peter. Together they made up a triumvirate virtually unparalleled in the world of military music. They toured the world with kings, princes and generals, and were all decorated on the same day in 1921 for their services to the Crown. Alison's grandfather P.S.G. taught the Prince of Wales to play guitar, Bertie taught him the ukulele and Rudy played tennis with King George. P.S.G. accompanied the future Edward VII on his tour of Canada in 1919. The Prince's letters to his mistress Freda Dudley Ward during that tour were later published and serialised in The Daily Mail. Rudy led the prestigious R.A.F. Central Band during the years of WWII and when B. Walton died prematurely in 1939 in Belfast whilst heading up BBC music, his death made front page news in The Evening News. Although Nina tried to find Walter's whereabouts, he withdrew his support from his wife and children in 1922, slipping away into North-West China. He was last reported, from NARA files, living and working in Shanghai in 1941, just before the bombing of Pearl Harbor. He was not interned by the Japanese but it is not known what became of him. Nina never breathed a word of her previous existence to anyone. Widowed at 50 and compelled to turn her back on her grieving mother, children, friends and extended family, she eventually fled to Ireland in 1946 to escape the past that threatened to catch up with her. Her glamour fading and her beautiful outfits ravaged in a flood in one of the series of basement flats she occupied with her daughter Paula in her twilight years, Nina, spent her last years reading, knitting and hobbling arthritically to do a little grocery shopping, spending what little she had on a few treats for her grandchildren. Both families had an album of wonderful photographs of Winifred/Nina, the two halves of which were brought together during a series of family reunions in the year 2000 after research proved that they shared the same grandmother. There are also a number of letters written by Walter, Raymond and a friend of Winnie's in Shanghai, which have survived the years. Alison wrote an emotive song, 'Mother of Pearl' for inclusion in the documentary (produced and directed by BAFTA award-winner Claire Faragher) and which was one of the tracks on her 2006 album Mise agus Ise. Alison also spent some years researching her paternal lines, tracing some of her Bools and spousal ancestors back to middle England, circa 1700, and the O'Donnells to Rahoon in Galway during the first half of the 19thcentury, before poverty and lack of opportunity following the years of The Famine drove her 14 year-old great-grandfather to seek his fortune with the British Army in India. In recent years Alison's first cousin once removed, Jessamy Harvey, made a massive breakthrough in finding the origins of her grandmother Nina's husband, Walter James Leigh. After 10 years of research by Alison and her two cousins, few recent facts had emerged. In 2010 it was discovered on the 1911 Census that Walter had been born in Chungking in China and the following year a Bristol-based academic, Robert Bickers, gained access to a letter written on the eve of the new 20th century by Walter's adoptive father, the explorer Archibald Little, in which he explained to a friend back in England that he was acting as a guardian to a young boy who had lost his parents. He stated that the boy was polite and showed promise and he would therefore school and clothe him. In September 2011, due to many new digitized records being uploaded to genealogical sites, Nina's1919 Emergency Passport Application, made almost a year after an initial application in 1918 (which was not granted due to the insufficient nationality status of her husband) to leave China and return to England came to light. This gave a vital, additional paragraph not contained in the original application which was accessed by a researcher in the U.S. hired by BBC4 for their documentary film. The emergency application was not available at that time due to having been taken out by another researcher. The additional paragraph was supported by two affidavits, once having been obtained by Walter from his adoptive father's wife, Alicia Little, who stated that in fact Walter was the son of Joseph Henry Burnett, an American, and Li Pi Chi, a Chinese woman. Walter had always maintained that his parents were American but had not been able to prove it. Whilst traveling out back out to China in 1915, the BBC uncovered the fact that his ship, the Yasaka Maru had been torpedoed by the Germans. Additions to archives now show that this news was on the front page of three prominent American newspapers, with the implied threat that if Mr. Leigh could have produced a U.S. passport, the Americans would have been obliged to take some form of military retaliation during WW1. Walter also always maintained that his parents had been killed in the Boxer Uprising, whereas in fact it has latterly been established that Joseph Burnett died during riots in 1895 on his way back to Hankow. The fate of his Chinese wife is unknown. He may not have known the names of his biological parents and it is entirely possible that Archibald Little anglicized his name from Li to Leigh to avoid the stigma attached to a child born of a mixed race marriage in China back in the late 19th century. It is now almost certain that this revelation caused the couple to have to leave the British Concession hastily and under a cloud of scandal. Once the correct surname was made known, a tide of information has flooded in. Joseph Burnett was a shady character who had left his father's home in Virginia in 1861, possibly to avoid serving in the Civil War. His father's ancestors can be traced back in Virginia to the eighteenth century. His brother, Chester Cary Burnett moved to Fresno California after the Civil War. Joseph worked for the Customs Office in Hankow as a tidewaiter but was dismissed for abusing the transit pass system. He had a number of relationships with Chinese woman and in 1880 he was tried by the Americans in China for abducting and imprisoning a Buddhist nun for almost a week for sexual purposes. The transcript of the trial makes for sensational reading and Burnett was fined $500 and imprisoned for a year. It may have been for this reason that Little may not have informed Walter of his true parentage. In 1895 a missionary fleeing riots took a rapidly ailing Burnett with him in his boat in a Christian effort to offer him absolution before his death. Burnett did not repent and died on board after 8 days. The missionary finally reached Hankow, purchased a coffin and buried Burnett. Recent news about three of my long deceased ODonnell relatives: My Great Uncle Bertie's granddaughter and I have for some time been negotiating with a number of British institutions to have his sheet music archived in a place where it will be protected and appreciated. Most of the collection was scored when he was a young man at the Royal Academy of Music. The British Music Society has declared that they would be very pleased to preserve it for posterity. This is great news as the paper is fragile and there is a vast amount of it. I shall be receiving some of his Irish pieces from my second cousin Beth McKey, once removed (I think! ), which means a lot to me. Robin Gilbert, a former pupil of my mother's cousin Peter ODonnell, poet and teacher, has spent some considerable time tracking down a few of our relatives to contribute towards writing a biography, family tree, and tributes and memories from colleagues and former pupils, together with all his poems (most published in the 60s) which he had republished. It has been a labour of love and enormous effort and research, affectionately and informatively compiled and we were delighted to see it in print in. It was rewarding to note that he was held in such high regard by so many people. Alison met in London with W.O. 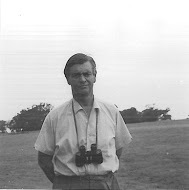 Gil Singleton, formerly of the RAF. Gil Singleton retired from The Central Band of the Royal Air Force after a long and distinguished career which included being principal percussionist of the Central Band of the RAF, Band Sergeant of The Band of the RAF Regiment and one of the founder members of the reformed RAF Squadronaires Big Band. Gil also developed a keen interest in the history of music in the RAF, pursuing this to the point were he is now one of the foremost authorities on the subject. As a result he has given lectures at The Royal Military School of Music at Kneller Hall. My other Great Uncle Rud was the Conductor of the RAF Central Band during World War II. He recruited the finest musicians and undertook a number of successful tours and concerts, including an appearance at the Potsdam Conference. Gil kindly let me have some memorabilia, not seen in our family since the 1940s. I recently discovered that my Great Great Uncle Stephen ODonnell is buried at the Basilica Notre Dame in Montreal. He was the organist there in the late 19th century. I looked up the building on Wiki and YouTubed the massive pipe organ - what a sound! All family trees uploaded to Ancestry.co.uk 2017. Photographs: P.S.G. O'Donnell (maternal grandfather), Nina Leigh (maternal grandmother), Jeanette Bools, nee Doherty (paternal grandmother), Peter O'Donnell (gt. grandfather), Peter (Pat) O'Donnell (2nd cousin once removed), Bertram Walton O'Donnell (gt. uncle on a cigarette card), Winnie, Walter & baby Raymond in Hankow c. 1916), Gertrude Shears wedding 1917, the O'Donnell brothers, Royal Marines, BBC Military Band, 1926 concert, O'Donnell family early 1880s India, 2 families reunion 2000 Belgium, PSG O'Donnell on board HMS Renown with the Prince of Wales 1919.